My copy of 'Dialogue and the Art of Thinking Together' is looking rather battered; it has been regularly pulled from the shelf and thrown into a bag for a read on a long flight - or simply reviewed to check a few points, or refer again to a diagram. 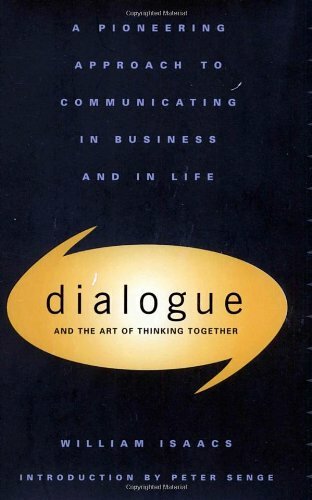 I was introduced to the book during my Master's in Organisational Change at Ashridge and the practice of dialogue and the reflexive approach it provides to the way we think has been foundational in my work ever since. "Generally, we think of dialogue as "better conversation." But there is much more to it. Dialogue as I define it, is a conversation with a centre, not sides. It is a way of taking the energy of our differences and channeling it toward something that has never been created before. It lifts us out of polarisation and into a greater common sense, and is thereby a means for accessing the intelligence and co-ordinated power of groups of people." "Dialogue fulfills deeper, more widespread needs than simply "getting to yes." The aim of a negotiation is to reach agreement among parties who differ. The intention of dialogue is to reach new understanding and, in doing so, to form a totally new basis from which to think and act." Isaacs takes us through the fundamental 'capacities' or practices of dialogue: listening, respecting, suspending and voicing and links these to David Kantor's 'Four Player System' while offering gentle anecdotes and stories that help us to see the potential for dialogic practice in action. "Recall the story of the first day when we brought steelworkers and managers together. They were excited by their own progress and began to speak about forging "a single container" that could include everyone. This led people to relax and begin to reveal how they really thought and felt. One manager suggested that man-hours per ton should be reduced. The steelworkers immediately reacted, seeing this as betrayal. It meant cutting or losing jobs. Now they were not polite - they vented." "A friend of mine once described dialogue as a state out of which we are continually falling."